his voice low, his tap on our tent’s metal pole. and pull my braids. I couldn’t save him. added my ballot, willingly, to the heap. 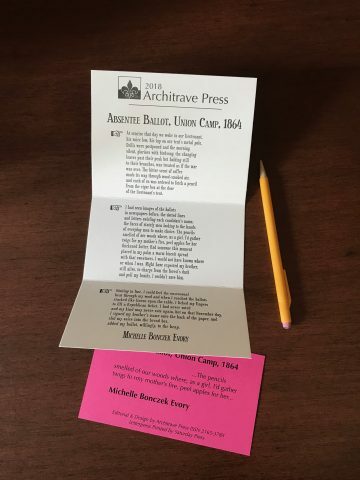 Poem letterpress printed by hand on 100lb archival card stock measuring 5 1/2″ x 10″ with 2 folds & packaged in an individual sleeve. Numbered edition of 50 copies.